Below is a list of forms that you may need while shipping with ECM TRANSPORT. Please fill out applicable form and email or fax to the appropriate ECM TRANSPORT department. Fax numbers are provided on forms. 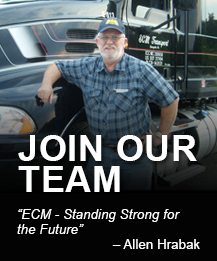 For questions please contact Customer Service at 1-800-548-7379 or customerservice@ecmtransport.com. The above documents open in PDF. If you do not have Adobe Acrobat Reader, Please click to download.